Moving on from my bitter breakfast... 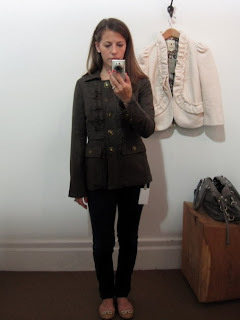 I swung by Anthropologie at lunch to try on the Boucle de Souffle jacket and the Graces Tank along with whatever else caught my eye. I should preface, I'm still trying to be good about buying things this month. With bigger purchases like fall boots and my new bag last month (and an overload of weddings, showers, and a anniversary), I wanted to cool the magnetic strip on my credit card for a bit, and so far I've been pretty good. Going to try on a $128 jacket had me worried. Which is bit silly, because I actually think $128 is a pretty good price for a quality jacket... but I'm a "price per wear" kinda girl and I don't like paying a lot for things I don't wear often... and how often would I wear an ivory wool blazer-y jacket thing?? When I grabbed the jacket I was surprised how thick it was... I knew from Chloe and Kim's reviews it wasn't a light jacket, but material is definitely a bit bulky making it more 'Jacket' than 'Blazer' (which I probably should have assumed from its name)... The detailing however was so pretty and you can tell the construction is top notch. Nothing about it felt cheap. Unfortunately, something just wasn't right. And I'm starting to agree with a few of the online reviews. I think there is just too much fabric in the bust area. And since I don't have much to help fill that area out, it just looked a bit boxy up top. 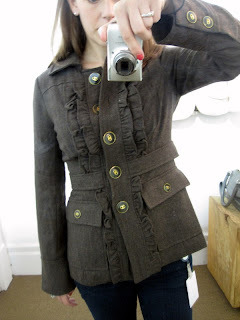 I suppose I could have dart puts in or an additional hook and eye, but I'm not so obsessed that I want to buy this jacket full price and then pay for alterations as well. Other than the bust area, the fit is great through the shoulders and bracelet sleeves. It hits at the top of my hips. I'll definitely reconsider if it's still around come sale time. 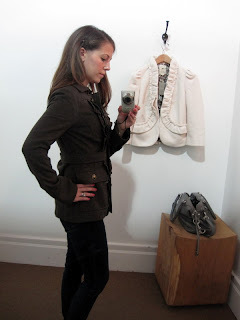 While I was scanning the store, I grabbed another jacket that caught my eye... and readers, I'll admit this now... this baby had me over that cute little ivory jacket the moment I put it on. I can't find it online, so it must be one of this week's many new arrivals. It's by Tabitha, and I grabbed my usual size 0. Definitely a bit more my style. 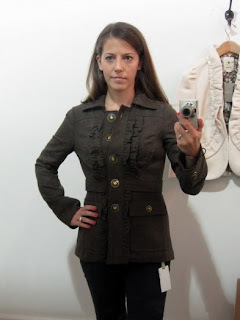 It's military inspired, still has ruffles - which makes it a bit tomboy and girly at the same time (like moi) and the fit and weight are perfect for fall. It's priced at $158, so it's more than the Boucle Jacket, but this I can see myself wearing almost daily as my jacket thru the fall. 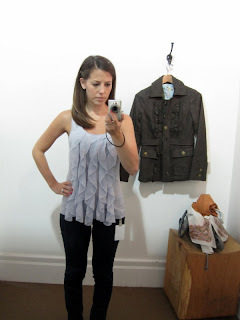 After mentally wishlisting this unnamed jacket, I tried on the Graces Tank. I had really hoped this was going to hit the sale rack since it was released at the beginning of the summer. Maybe in another week or two, if I can wait that long. I can't speak for the white version, but yes, it's sheer. If I were to wear it layered there is no need for a cami, probably no need for one at all with the proper undergarments, but I like to play it safe. I love the length and the fit. I also like that the ruffles lay flat for the most part, and of course the color - one of my favorites. Stick with your true size. ...and I think so! Another cardigan wishlisted for a sale. Lastly, my outfit of the day. I'm wearing two new purchases for the first time. 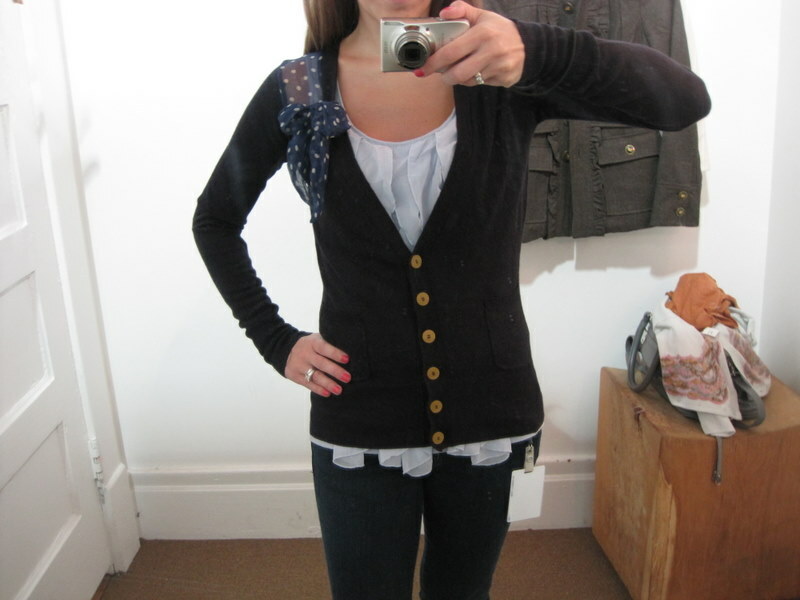 Everyone knows I was obsessing about the Deco Page Cardigan the minute it hit stores, I snagged it NWT for less than retail on ebay which makes me happy since the cotton is soo light, it's just not worth $98. And as expected, I paired it with J.Crew's Petal Stream Tank.... which is now on Final Sale and you can get 30% OFF the current price of $24.99. Anyone grab anything from Anthro's sale?? LOVE the unnamed jacket on you! I agree that the white jacket does look a bit boxy towards the top, but it's a beautiful piece. The Graces tank is really nice on you!! 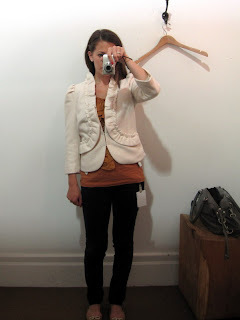 I saw the unnamed jacket in my store yesterday and loved it! It looks perfect on you! 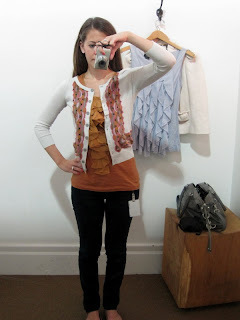 I am sorry the Boucle De Souffle jacket didn't work for you, but I see how it's just too big :( That graces tank is so pretty on you, especially with the cardigan!! Now I want it since I own the cardi. Lastly, i LOVE your outfit today - so cute! Oh wow, I LOVE that unnamed jacket! I'm going to have to look for that next time I go into Anthro! I was already planning on getting the Graces Tank in ivory but now you've made me want the lilac too! Andi - the willpower was crazy! I think its because I couldnt decide between the 3 which I wanted more... I'd also really like to get the tank and cardigan on sale if possible, I just hate worrying about sell out risk, ugh! That second jacket is ADORABLE. I love. I too love the nameless jacket on you. I also find the JCrew tank you are wearing adorable. What size did you get on that top? I grabbed a XXS, I suggest sizing down. ^Haha, so true. :) We really need to go shopping together sometime!